Today It feels like Spring is just around the corner…and actually the 20th is next week! a perfect place to do that is on Main Street in Chester! The Shops are all open and ready for your spring business! 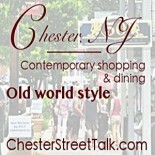 This entry was posted on March 15, 2019 by elegantparis in Chester Business, Chester New Jersey, Other and tagged Bountiful Gardens, chester country furnishings, Chester NJ, Chester NJ Main Street Shops, imagiNations, Objects of Desire Boutique, Publick House, Shopping and Dining, support small business in new jersey, The Whistling Elk, Window Wear.